Peter Douglas Briggs was born in Lismore, NSW on 23 February 1945 and educated at Lismore High School. He entered the RAN College (HMAS Creswell) as a Junior Entry Cadet Midshipman in 1961. Briggs graduated in 1964 and undertook training at sea in the destroyer HMAS Vampire during 1964-65 and the aircraft carrier HMAS Melbourne in 1965. He was subsequently awarded the RANC Memorial Sword for the best results in stage two training in the fleet. Following training at the Britannia Royal Naval College, Dartmouth and warfare training with the Royal Navy in 1966-67, Briggs joined the RAN’s fledgling submarine service. He was promoted to Lieutenant in November 1967. On completion of submarine training, at HMS Dolphin, he was awarded the Max Horton prize as the top graduate and served as torpedo and navigation officer of HMS Otter during 1967-68. In late 1968, Lieutenant Briggs was posted to the new submarine HMAS Ovens which was being built at Greenock in Scotland. He served as the navigator during her work up and return to Australia. He then joined HMAS Oxley as the sonar officer in late 1969. This appointment was followed by service as a Year Officer at the RAN College during 1971-72. In March 1973, Briggs took command of HMAS Otway, while the submarine was in refit, and reverted to being the Executive Officer in September of that year. In early 1975 he proceeded to the United Kingdom to undertake the submarine commanding officer qualifying course (known as the ‘Perisher' course). Upon return to Australia, in July 1975, Briggs was posted additional to the submarine base HMAS Platypus and then in November he was promoted to Lieutenant Commander. In December 1975 he took command of Otway. Briggs commanded the submarine until late 1977 after which he completed the Royal Navy Staff Course at Greenwich in 1978. On his return to Australia he served at Platypus until he was appointed as the Commanding Officer of Oxley for the period July 1979 to December 1980. Briggs was promoted to Commander in June 1980 and served as the Director of the Submarine Warfare Systems Centre during its formation, accomplishing the introduction of a new combat system, shore simulator and software support centre for the RAN’s submarine force. On completion of this posting he was promoted to Captain in June 1985 and in January 1986 he was appointed as a Member of the Order of Australia (AM) in recognition of service to the RAN as the Director, Submarine Warfare Systems Centre HMAS Watson. Briggs then attended the Joint Services Staff College, Canberra, in 1985 prior to taking up command of the RAN Submarine Squadron, and the submarine base HMAS Platypus, in 1986-87. After serving as the Director of Submarine Warfare at Navy Office, during 1988-89, he was promoted to Commodore, in December 1989, and then attended the Indian National Defence College during 1990. 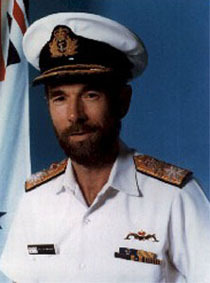 Commodore Briggs then served as the Naval Officer Commanding Western Australia and commanding officer HMAS Stirling in 1991-92 during a formative period of the RAN’s Fleet Base in the West. As a result of this service he was awarded the Conspicuous Service Cross in 1993 in recognition of service to the RAN as the Naval Officer Commanding the Western Australia Area and Commanding Officer of HMAS Stirling. While serving in Western Australia he was also honourary Aide-de-camp to the Governor-General. He then took up the posting as Commodore Training, heading the embryonic Naval Training Command. Briggs was promoted to Rear Admiral in November 1993 and became the Flag Officer Naval Training Command. As a result of this service he was appointed as an Officer of the Order of Australia (AO) in June 1997. In July 1997 Rear Admiral Briggs was appointed as Head of Strategic Command Division within the Australian Defence Headquarters and then in July 1999 he was selected as Head of the new Submarine Capability Team. In May 2000 a new position was created in the Defence Material Organisation titled Head Systems Acquisition (Submarines) and Rear Admiral Briggs effectively headed both these activities. Rear Admiral Briggs retired from the RAN in 2001. Since retirement he has maintained an active interest in naval matters and is the President of the Submarine Institute of Australia and was Chairman of the AE2 Commemoration Foundation Ltd and the Finding the men of AE1 expedition in 2017 that successfully located the wreck of the lost submarine.